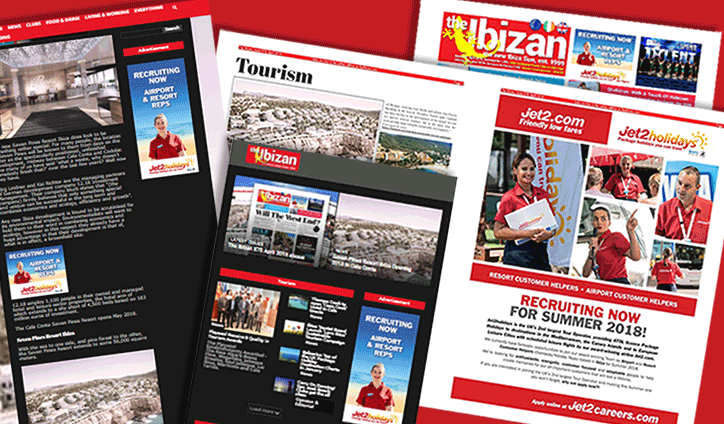 The Jet2.com Ibiza recruitment advertising campaign demonstrates an effective application of both print and online banner advertising, tailored to the specific objectives of the campaign. Jet2.com are a leading flight and package holiday operator, with a strong presence in Ibiza. The requirement on this occasion is to attract employment applications to fulfill posts in a substantial recruitment drive at the start of the summer season 2018. The positions are Ibiza based airport and resort customer helpers. The campaign needed to be concentrated into the shortest possible timescale to facilitate the client’s target dates for completion. Potential applicants could be situated in Ibiza, or from the returning summer workforce in the U.K. The client had taken the time to talk to The Ibizan to explain the type of person they wanted to reach. “We could have just taken the advertising order and left it at that. But we want our advertising to work for our clients. We want it to work so that they come back for more. Due to this campaign’s short timescale, a big hit from a full page advert is the more effective route. The client booked in good time allowing us to give them a very good position. We allocated the first right facing colour page in the newspaper. Furthermore we positioned our ‘Tourism’ news section adjacent. This ensured all those with an interest in the sector could not fail to see the advert. We added a front page above-the-fold reference block at no additional charge – just because we are very nice people. In-article banners give the highest return CTR. 4th paragraph gives sufficient time for page rendering, at a position that will be seen by 99% of visitors. 300×250 is friendly on all devices and avoids any risk of a counter-productive resentment given by readers to more aggressive formats. We gain attention by the simple method of having the ad stand alone in a single unit. 600×250 in our sticky sidebar, ensures that a prominent banner remains in the viewport of desktop/laptop visitors. This approach is particularly effective for long articles. 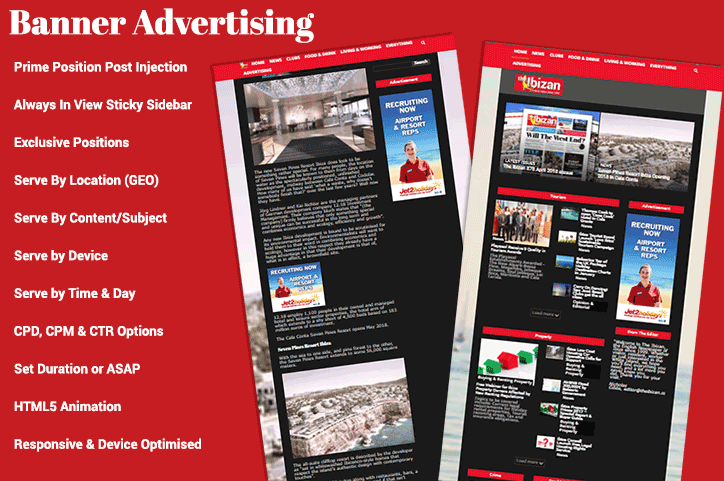 For mobile visitors, the 600×250 format is 2.5 times the height of any other standard ad unit on our website. This gives the advert a ‘stand out from the crowd’ benefit when the visitor swipes past the end of the article. 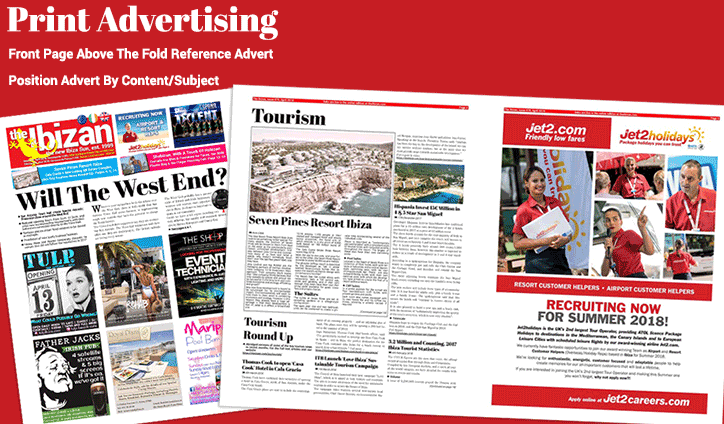 We gave the heaviest weighting available to the Jet2.com adverts for any article tagged with the terms relating to ‘tourism’ ’employment’ or ‘business’. Our aim was to focus on potential applicants but also those in business who would naturally network the recruitment campaign. Also ‘regulations’ and ‘accommodation’, being common areas of interest for people coming to the Island to work. We set GEO tagging to Spain and the U.K. This ensured the client’s spend was not wasted on, for example, our readership in the U.S.A. who would not have the necessary legal status to apply for their jobs. We created a new bespoke home page position for the client advert for the duration of the campaign, to give ‘first sight’ branding and prestige to new visitors.